Here at G2 Graphics we pride ourselves in pushing the limits on new trends in the t-shirt printing & apparel design industry. Our team is comprised of progressive creative graphics design experts and dedicated t shirt printing specialists. We specialize in a variety of t-shirt print shop ink techniques ranging from traditional to specialty printing. Our in-house design team can help you develop your idea into a custom design or you can send us your own artwork and we'll finalize the project for you. We are committed to providing high quality work that fits within your budget. All jobs are printed on-site in our cutting edge silk screen printing production facility to ensure personal attention to each and every project. When you're in need of a larger quantity of shirts, silkscreen printing is a favorable choice since orders are taken by the dozen. Our company offers several ink technique options to fit the look and quality of print you're looking for. See the different ink options available below and find the right one for the look you would like to achieve. Plastisol ink is the most commonly used ink in the t shirt printing industry. Plastisol inks sits on top of the fabric giving the image a superior color saturation and durability. Waterbase ink is another commonly used ink in the industry. 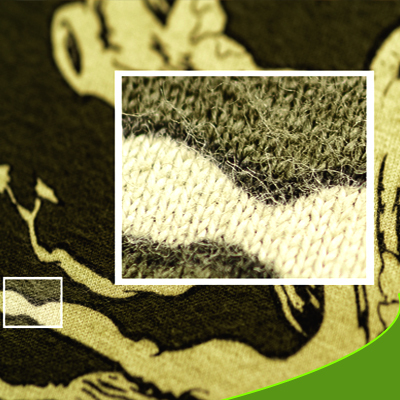 Waterbase inks absorb into the fabric giving the image of dyed fabric saturation and durability. Discharge ink is a water based product that is formulated by adding an activator to the ink in order to remove the dye from the fabric. Discharge works on 100% cotton. Excellent for dark colored Garments. This plastisol ink is mixed with an additive to soften the ink. It creates a soft hand feel. This technique is often used to create a "vintage" look. Metallic inks are infused with small particles to create a shimmer look. They are great for creating a foil or glitter imitation. Featured as one of the top 20 screen printing shops in LA!! A reflective mirror like technique applied by printing a coat of adhesive to the garment and then heat sealing the area with a sheet of foil. Great for those who like a little Bling!